The Fleadh Cowboys are delighted to announces they are reforming for a Bob Dylan tribute gig on May 24th to be held in the Button Factory on the occasion of his 70th birthday. The show titled - Salute Him When His Birthday Comes – will feature The Fleadh Cowboys as the house band with guests artists. A number of top artists and guest presenters have signed on and a full line-up will be published later. 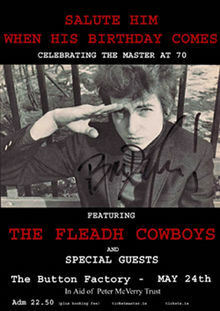 The last time The Fleadhs performed together as a band was for a similar concert to celebrate Bob’s 60th birthday in HQ in Dublin. That show was co - promoted with Larry Roddy and this one will honour his memory as Larry sadly passed away late in 2010. Henry Mc Cullough , Left Right and Centre, Shay Healy, Ronan Collins, ...........more to be added.